Walking along the banks of the Tiber, en route from Trastevere to Vatican City, lies an unassuming building. If you weren’t looking for it, you might even continue walking along the Via della Lungara but that would be a pity. Stop and take a glimpse through the courtyard, past the small but well-manicured Italian-style gardens. What you are looking at is Villa Farnesina, built between 1500-1510, and one of the best examples of Renaissance Italy still standing today. The detail and beauty is extraordinary - indeed, I don’t think I saw a centimetre of space that was not decorated. In the Hall of Perspectives and Hall of the Frieze, you will see frescoes of other mythologies. In the Wedding Hall - originally used as a bedroom by its first owner - frescoes were painted on the walls in 1517 by Sodoma, portraying the life of Alexander the Great. Commissioned by an extremely wealthy banker from Sienna - Agostino Chisi - from the outside (as I said before) the villa looks quite ordinary. But inside is another matter for the walls and ceilings of both floors are are covered in exquisite frescoes painted by Raphael, Peruzzi and del Piombo. The building was designed in a ‘horseshoe’ style, with two wings between the central area. 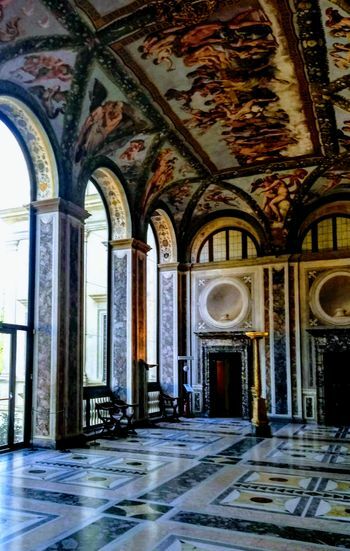 Between the wings is a loggia (covered exterior gallery) which is where various fables of the story of Psyche can be seen, depicted by Renaissance artists. Take a good look at the north side, where the Marriage of Alessandro and Rossane is depicted (look at the winged children carrying lit torches - this is a sign that a wedding is imminent). In conclusion, if you want to spend a couple of hours immersing yourself in the history of the Italian Renaissance, then this small (by Italian standards) villa is a must-see. And since it’s so close to the beating heart of Trastevere, there’s many a pasteccera or hostaria to sit in afterwards, whilst you contemplate the glory that was 16th century Rome. The loggia of Galatea also contains frescoes by a number of artists, with Piombo (from Venice, and one of the most famous artists of the day) painting scenes from Ovid’s ‘Metamorphoses’. Galatea, according to the legend, was a beautiful nymph (Galatea actually means ‘She who was milk-white’ ) with whom the mortal Acis fell in love.